Nice place good central location lovely fresh breakfast and friendly staff. Good breakfast, with availability to make your own tea. Excellent shower. Friendly and helpful staff. Personal de recepción encantador. Impresionante tilo en la entrada de 300 años. Desayuno correcto. Frühstück war große Auswahl. Honig war lecker. Einmalig. Zimmer gut ausgestattet. Alles bestens. Sehr sauber, sehr nettes Personal, mit Liebe und abtiker Möbel eingerichtter Restaurant- und Lobbybeteich. Die Lage fußläufig zur Endstation der S-Bahnlinie 5 und die sehr schöne Lobby war klasse. Personal und Frühstück waren gut, da gibt es nichts zu meckern. Die Anfahrt war auch optimal gelegen für einen Termin in Frankfurt. UNA BONITA TERRAZA MUY AGRADABLE CON CERVEZA GRATIS!!!! TODO UN DETALLE. Efficacité pour me changer de chambre (odeur de tabac). Gentillesse de la réception. Hotel charmant, avec non mentionné une piscine avec un décor sympa..
Lindenhof Landgasthof Hotel This rating is a reflection of how the property compares to the industry standard when it comes to price, facilities and services available. It's based on a self-evaluation by the property. Use this rating to help choose your stay! 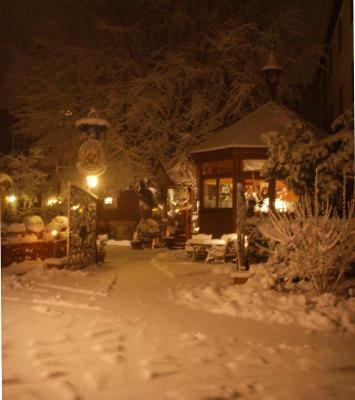 This country hotel lies in the center of Friedrichsdorf, 12 mi north of Frankfurt city center. It offers free parking, good A5 motorway access and an outdoor swimming pool. Guests benefit from a garden. 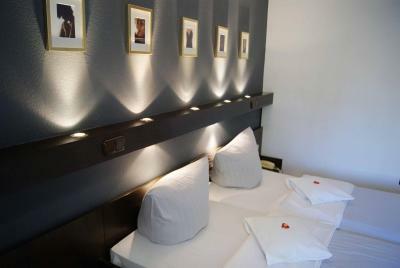 The rooms of the Lindenhof Landgasthof Hotel are individually furnished. 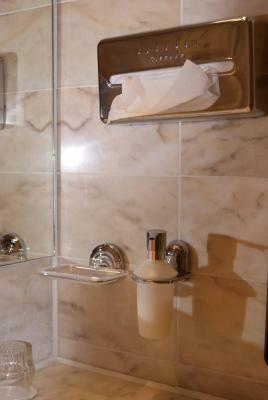 All rooms feature a private bathroom and free WiFi. A daily breakfast buffet is available at the Lindenhof. The property also serves homemade soup. The soup of the day is free of charge. Various restaurants can be found in the neighborhood. The Friedrichsdorf S-Bahn (city rail) station is a 6-minute walk from the Lindenhof Lastgasthof. Frankfurt's main railway station is just a 30-minute journey from here. 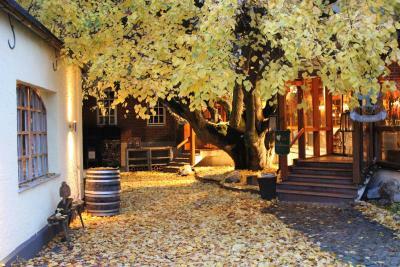 When would you like to stay at Lindenhof Landgasthof Hotel? Modern room features cable TV and a private bathroom. House Rules Lindenhof Landgasthof Hotel takes special requests – add in the next step! One child under 3 years is charged EUR 10 per person per night in a crib. Lindenhof Landgasthof Hotel accepts these cards and reserves the right to temporarily hold an amount prior to arrival. Check-in after 22:00 is possible via a key box. Guests will receive the key code after booking. The place looks a bit outdated and has an atmosphere as if it will be closed in due time. Although the hotel advertises itself as a cosy place, the hotel was abandonned. Door-, and roomkey could be found in an outside letter box. All areas in the hotel were dark and closed. No breakfast, no internet, saw no one, except 2 other guests who were lost and totally confused as well. Received a call from the hotel management in the afternoon, after I left, to ask if they could send me the invoice. After all, the lady apologised for the poor service given. Wifi a bit unstable, but worked most of the time.